Mt. 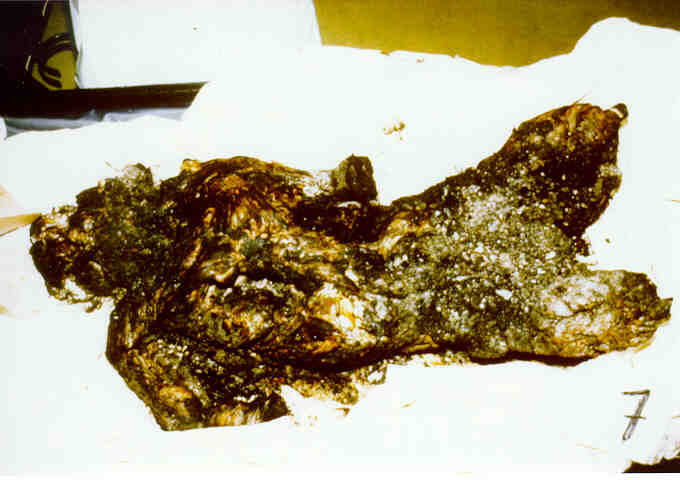 Carmel Doe 7: Autopsy photograph of the alleged remains of Steven Emil Schneider. According to the autopsy report, Steven died of "craniocerebral trauma due to gunshot wound of mouth." The dead can speak. Much can be learned from examination of the corpse. For this purpose the Museum has obtained a set of the autopsy reports and photographs. They bear remarkable evidence, much of it yet to be analyzed. At the center of the public opinion storm around Waco is the fate of the mothers and children whose remains were found in the pantry/concrete room that formed the foundation of the four-story residential tower (see US News & World Report, May 3, 1993, where it is erroneously labeled "Cinder-block room;" Treasury Report, pg. 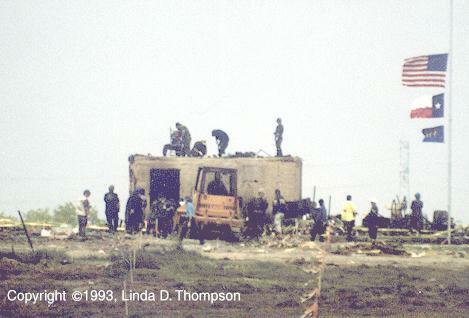 39; Linda Thompson photo; and US News & World Report, May 3, 1993). Before the fire of April 19, this room received no attention. After the fire, it was invariably called the "bunker," the term that had hitherto been reserved for the tornado shelters. It is said that the mothers and children, equipped with gas masks, wet blankets, and sleeping bags, sought shelter there from the CS tear gas; instead of being sheltered, they died when the structure collapsed on them. But the evidence shows that this story was invented. 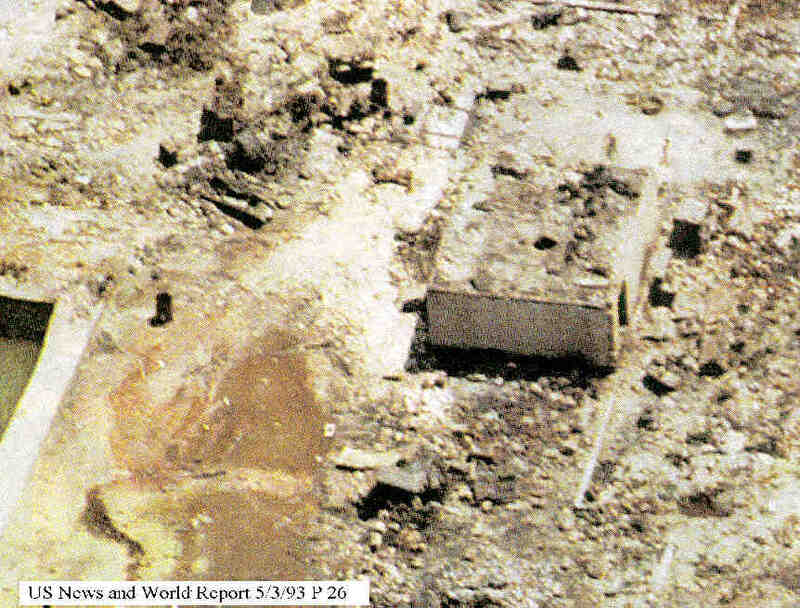 Photographs show the concrete room did not collapse. The evidence suggests that the mothers and children died elsewhere under different conditions, and the bodies were brought into the concrete room after death. The bodies in this room were variously charred beyond recognition or slightly charred; some were severely decomposed, some only moderately; some dismembered and badly mutilated, others were whole. The people are said to have died variously of smoke inhalation, suffocation, blunt force trauma, gun shot wounds, or burns. Joseph Martinez (Mt. Carmel Doe 52) and Crystal Martinez (Mt. Carmel Doe 57) are recognizable as human forms. Their Autopsy Reports indicate that the remains were only moderately decomposed, and suffered little charring. But the remains of Katherine Andrade (Mt. Carmel Doe 30) and John McBean (Mt. Carmel Doe 32) were virtually incinerated. This is an unexpected effect, given that there is little to burn in a concrete room, and given that the fire lasted only 40 minutes. Some people explain the charring of the bodies by suggesting that the room was a storehouse for ammunition, and the ammunition caught fire. The plausibility of this explanation will be examined in due course. Some corpses were so decomposed that the connective tissue between the bones had disintegrated, causing the bodies to fall apart (the process is called "disarticulation.") Other corpses were so decomposed that the internal organs were unrecognizable, had turned to mush, or were liquefied. From a review of professional literature, we will see that this degree of decomposition is usually effected over a long period of time. A means was used for accelerating the decomposition of some of these remains, making any ordinary estimation of the time of death meaningless. Many of the bodies in the concrete room/pantry appear to have been torn apart, as in the case of Melissa Morrison (Mt. Carmel Doe 74). Only Melissa's lower legs were found. In one case, the body parts of eleven (11) people were reformed into an agglutinated mass, as if kneaded together under the tracks of a tank or compacted in a press. Several photographs are on exhibit—photos were obviously taken after the mass had been sectioned off. (Mt. Carmel Doe 64 A picture, Mt. Carmel Doe 64 B picture, Mt. Carmel Doe 64 C picture, and Mt. Carmel Doe 64 D picture). Mt. Carmel Doe 64 E picture). Even more remarkably, the deceased, found compacted like this, were said to have died variously of smoke inhalation, suffocation, and gunshot wound. It is obvious that these people died in different environments, and their remains gathered together after death and pressed into mounds. No series of circumstances known so far could have this effect. But when a body is crushed by the simple force of a weight falling from a few feet, perhaps the height of a ceiling, the body parts tend to remain together, even if physically severed by the force. They retain something of the original spatial relationship to each other, as we can see in many fossils. The bodies in this concrete room, however, do not follow that rule. Inside the pantry/concrete room we find heads without trunks, trunks without heads, trunks without limbs, limbs without trunks. We find severed feet and a piece of scalp with a pony tail. We see that an agglutinated mass has been created out of the remains of 11 (eleven) persons. Even if the recovery of the bodies inside the concrete room was so clumsy that body parts were lost during the operation, one must assume that the body parts had already been severed. Widespread dismemberment of bodies throughout the room is not the result of concrete falling from a two-foot hole in the ceiling in the middle of the room. Many of the bodies found in the concrete room were headless, and identification had to rely on fingerprint or DNA identification in the FBI laboratory. By an unknown cause, the roof of the concrete room was damaged. A hole, 18 to 24 inches in diameter, appeared in the roof. On top of the roof nine bodies were found; beneath the roof, some 33 to 43 bodies were found. This was a crime scene if ever there was one. That roof should have been shored up with posts, beams, and plywood to preserve the integrity of the evidence. Instead, the roof was permitted to crumble slowly over a period of days, contaminating the evidence below. The hole got larger, the roof weaker, and the rubble contaminant continued to fall. The rubble was sent with the bodies in the body bags to the autopsy tables. Then, memorialized in the Autopsy Reports, a false explanation was offered—that many victims died from blunt force trauma or suffocation when buried by the "structural collapse." The false assignment of cause of death also appeared in the Department of Justice Report. The chief medical examiner, Dr. Nizam Peerwani, and his forensic dentist, Dr. Rodney Crow, were present at the beginning of the recovery when the hole in the roof was comparatively small. The curator of anthropology at the National Museum of Natural History at the Smithsonian Institution, Dr. Douglas H. Ubelaker, and his associate, Dr. Douglas W. Owsley, traveled to Waco to assist Dr. Peerwani with the recovery of the bodies. Dr. Ubelaker is a nationally recognized forensic expert and is a regular consultant to the FBI. These anthropologists are world-class evidence handlers, and should have had the necessary know-how to ensure preservation of the roof. The names of Drs. 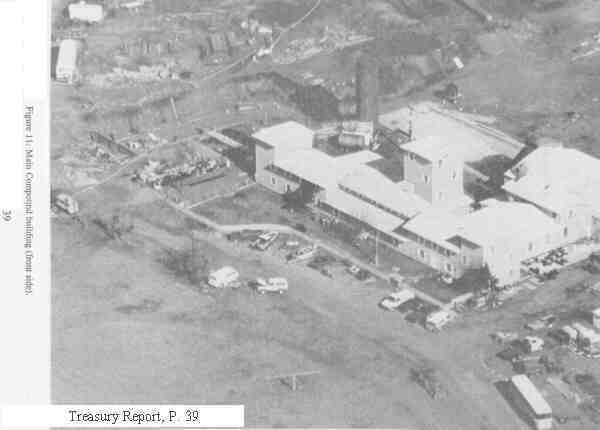 Ubelaker and Owsley appear on the Autopsy Reports as having done the anthropology examinations. These experts should have known the truth and may have had a significant hand in the final version of the DoJ Report. The visitor's attention is drawn to the awful injuries of John McBean (Mt. Carmel Doe 32). It would appear this body's arms, legs, and head were mechanically amputated. The stumps are abrupt, and inconsistent with the graduated amputations caused by the ambient heat of fire. Similar injuries can be found on other corpses found outside the concrete room—for example, the corpse of Mary Jean Borst (Mt. Carmel Doe 45). "If the bodies are still relatively intact, you can certainly determine a lot more than anybody imagines." — Norm Carmack, chief medical examiner's office, Austin, Texas as quoted in The Washington Post, April 21, 1993. Apparently, someone did not want this to happen. And if so much was done to disguise the manner in which these women and children died, how did they really die? Did the horrors of violence and mutilation demonstrated upon these remains happen after death, or was violence and mutilation practiced upon the living? Perhaps much more can be gleaned from this evidence than we have been able to determine. Perhaps, in combination with other information, these questions will be answered.